This photograph has been scaled down; full resolution photograph is available here (740 by 597 pixels). 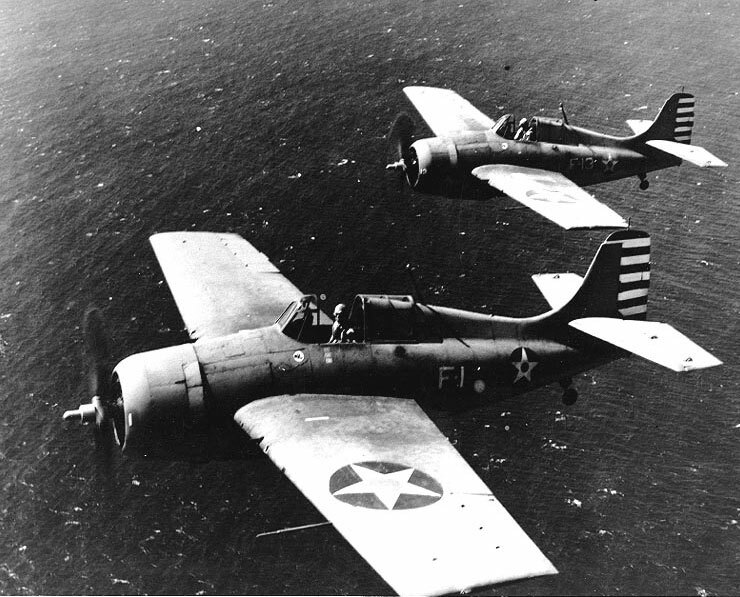 Good air to air shot of two Grumman F4F-3's F-1 is flown by Lt.Commander John S. Thach Commanding Officer of FV-3, Thach has three kills. Second fighter, F-13 in formation, flown by Lt. Edward 'Butch' O'Hare,who has five kills On February 20, 1942 O'Hare shot down five Japanese bombers. O'Hare became the Navy's first ace and was awarded the Medal of Honor Kills represent the number of Japanese aircraft shot down up to April 10, 1942 by each pilot.